Current global crisis highlights endemic and structural problems in the democratic political system. With different repercussion depending on Northern or Southern countries, a common reaction from citizens against political power has just started. Arab revolutions or social movements as 15M in Spain, Occupy London and Occupy Wall Street are some examples, all over the world, of pacific demonstrations from citizens. All of them share the same features; the demand of a new form of democracy where people have a more participative role, the claim of public spaces as deliberation places and the use of new technologies for spreading information. Although the term of Governance has been developed by international institutions such as the World Bank, the United Nations or the European Commission from the '90s, people's participation in political processes is still limited to not binding consultation, far from decision-making through deliberation. The change of scale, from national to local, opens a new field of debate, where politicians are closer to citizens' problems and needs. 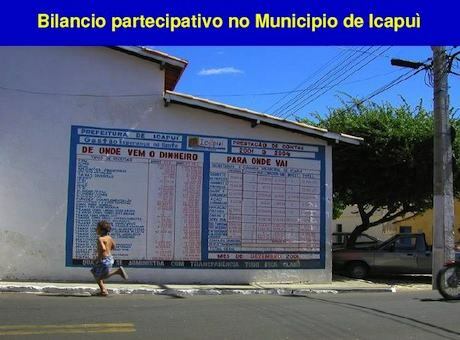 Participatory budgeting, in where part of public budget is decided by citizens, has shown the potentiality of its methodology to change 'the rule of the law'. The case study of Malaga province in Spain, where regional government boosted Participatory Budgeting through a political commitment, is a paradigmatic example of participatory processes in rural areas at local level.